Surface Set Diamond Core Drill Bits are available in an endless variety combining diverse specifications such as diamond size (SPC - Stones Per Carat), diamond quality, diamond exposure, matrix hardness, crown design, fluid passages and numerous designs to suit core barrels manufactured to many standards. The right combination must be chosen to achieve fast drilling and low drilling cost. Diamond size is governed by the rock type. Usually the hardest rocks require the smallest diamonds and the softest rocks require the larger diamonds. 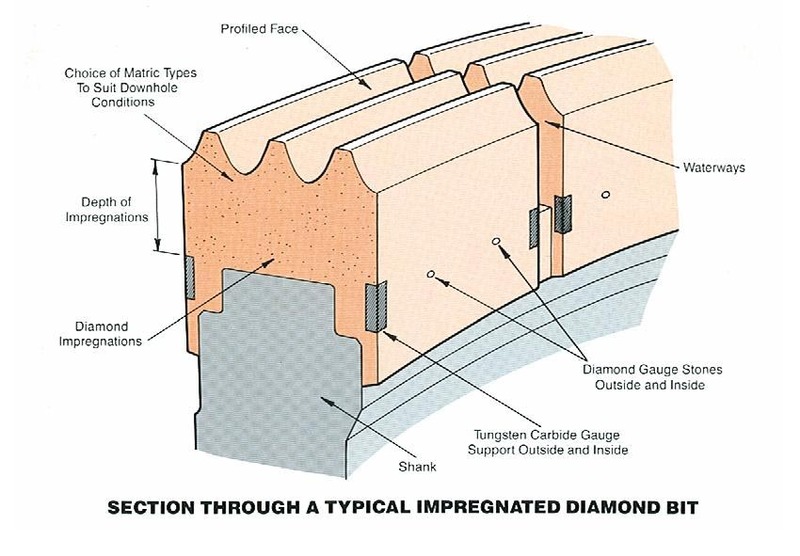 Diamonds range in size from 10 to 110 SPC. Diamond quality is also determined by rock formations and the hardest rocks require the best quality diamonds, with less hard rocks requiring progressively less expensive diamonds. Diamond exposure is relative to diamond size and the AUSBIT Series and DIAMINDRILL Series of bits have proven standard exposure for all diamond sizes. Matrix hardness must be suitable for the rock formations to be drilled. A range from standard to very hard matrices are available. Crown design is again governed by rock formations. Bits with narrow "faces" and many steps are preferred for competent, hard formations and wider "face" bits with less steps or semi-round crown designs are more suitable for soft and/or abrasive formations. Fluid passages are determined by the friability of the core, the bit design, the capacity of the pump and the diameter of the drill bit. Clients are able to specify all of the above design variables or leave it for Ceramco to recommend the most suitable drill bit for their particular application.